Arrive at your hotel and check-in. Rest of the day is at leisure on own. This morning, leave for the airport to take the flight to Paro. The flight into the Himalayas reveals breathtaking views of the world’s highest peaks, taking you right into the Dragon Kingdom’s cloud scraping airstrip in the lush green valley of Paro (alt. 7000 ft). After clearing immigration and customs, step into the receiving area where we meet our Bhutanese tour director and drive to Thimphu, the capital city of Bhutan. Late afternoon/evening, visit Tashichhodzong, the beautiful medieval fortress/monastery that houses most of the Government's office and the King's Throne room. It is also the summer residence of Je Khenpo, the Chief Abbot. After breakfast embark on a sightseeing tour of Thimphu. Visit the National Library which has a vast collection of ancient Buddhist texts and manuscripts. Later, drive to the Painting School, famous for traditional ‘Thangkha’ paintings. See students at work, producing intricate designs on cloth. Also, visit the Traditional Medicine Institute where centuries old healing methods are still practiced. Thereafter visit the Textile and Folk Heritage Museum, a fascinating testimony of the Bhutanese culture and living traditions. After lunch, visit the Handicrafts Emporium which displays a wide assortment of beautifully handwoven and crafted products. From there drive to the Memorial Chorten, the stupa built in memory of Bhutan's 3 Third King who is popularly regarded as Father of modern Bhutan. The paintings and statues inside this monument provide a deep insight into Buddhist philosophy. After breakfast, check out and drive to Punakha with a short stop en route at the Dochula pass (3,050m) that offers enchanting views. Arrive in Punakha and check into our hotel. After lunch, proceed to visit the Punakha Dzong, the 17th century fortress which has played an important role in building up of modern Bhutan. Thereafter visit the Khamsum Yulley Namgyel Chorten, the newly built stupa. After the visits in Punakha, drive to the nearby town of Wangduephodrang and visit the local market which is famous for its bamboo products, slate and stone carvings. After breakfast, check out and drive to Paro en route visiting the Simtokha Dzong, the oldest fortress of the Kingdom built in 1627; it now houses the School for religious studies. Arrive in Paro and check into your hotel. 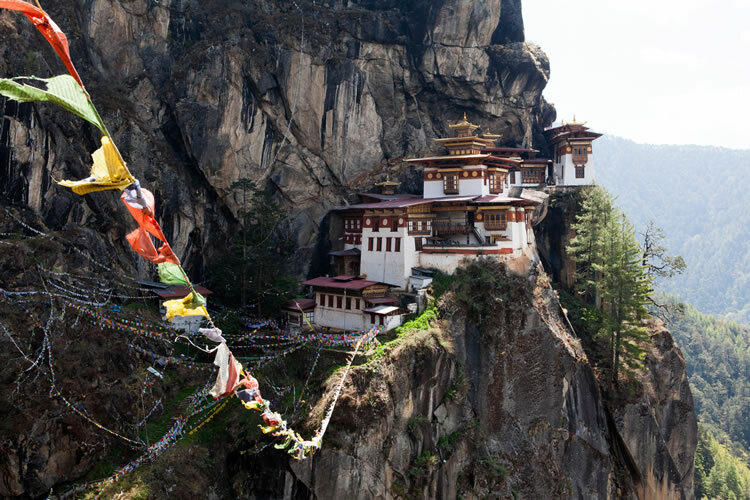 After an early breakfast, depart for an excursion to the Taktsang Monastery, the most famous of Bhutanese monasteries. It is said that Guru Rinpoche arrived here on the back of a tigress and meditated at this monastery, hence it is called the "Tiger's Nest". Non Buddhists are not allowed inside the monastery. Therefore, view the monastery from a view point nearby. The trek/hike to the view point takes about 5 hours for a round trip. In the afternoon, drive north of Paro valley to the ruins of the Drukgyel Dzong. From this fort the Bhutanese repelled several invasions by Tibetan armies. Later, visit nearby traditional Bhutanese Farm 4 House which offers a good insight into the lifestyle of the local people. On our way back, we visit the Kichu Lhakhang, one of the oldest and most sacred shrines of the Kingdom. After early breakfast, we drive to Paro airport to board our Druk Air flight to Kolkata. On arrival at Kolkata airport, we step into the receiving area where we will be met by our representative and transferred to the hotel. Arrive in Jorhat and transfer to Neamati Ghat (with packed lunch) where an assamese welcome aboard the MV Mahabaahu awaits us. After the essential safety briefing, check into your cabin. On the Donyi Polo Deck, raise a traditional toast to the mighty Brahmaputra River that carves the valley of Assam. If lucky you can catch a fleeting glimpse of the Gangetic headed geese, egrets and cormorants returning to their abodes on deserted islands as the sun lowers itself in the western horizon. Enjoy a talk on'Sibsagar, the seat of Ahom Civilisation'that ruled the north eastern region of India for six centuries. A short talk on 'Tea in Assam'continues over High Tea. A relaxed evening in the Soma Lounge followed by a sit down welcome dinner completes the day. After an early breakfast, start your day excursion to Sibsagar, the ancient city and capital of the Tai-speaking Ahoms who came in the 13thCentury AD to the area from the north east and were essentially of Tibeto-Burman origin. Sibsagar town literally means 'the ocean of Lord Shiva’ as it is built around a huge man made water tank ordered by the Ahom Queen. The Shiva Dol, constructed in the year 1734 is believed to be the highest Shiva temple in India. Visit The Talatal or Kareng Ghar, the palace of the Ahom Kings and the Rang Ghar, an amphitheatre, a place of entertainment or important meetings for the Royals and their guests. Afterwards, drive to a Tea Estate for a relaxed afternoon and a traditional Assamese lunch with the estate family who have been involved in the tea business for over a century. As you have your breakfast, sail towards Majuli, a cosmos of Assamese culture where various philosophies co-exist and thrive. After breakfast, enjoy a talk on 'Majuli, the seat of Vaishnav culture’ and proceed in the excursion boats to the mainland where a drive takes you to a scenic corner of a ‘Satra’ (monastery) for an interesting cultural performance by Satriya singers and dancers. Next, proceed to Kamlabari Satra to witness the Vaishnavite priests dancing to the rhythm of cymbals, drums and chanting in the temple premise. Enjoy hot lunch on MV Mahabaahu and sail towards the closest Mishing Village. The Mishings live on the bank of river in 'Chang Ghars', houses with raised platforms. All Mishing women are expert weavers. You can buy ethnic colourful cotton weaves and indulges in a dhoti tying and Mekhela Chaadar wearing demonstration. After the Mishing Village visit, MV Mahabaahu heads towards Dhansiri Mukh where the waters of Brahmaputra and Dhansiri meet, while you enjoy a talk on ‘Assam, its geographical location & importance’. Later enjoy the evening under the stars on a deserted island and proceed for dinner. MV Mahabaahu sails towards the Eastern Range of Kazirang. Enjoy breakfast and a talk on ‘The River Brahmaputra and the life that exists alongside’. and proceed for the boat safari . The shores are high but one can see roof turtles on protruding drift wood, water lizards, otters, elephants, wild buffaloes, rhinos, darters, herons, pied kingfishers, white throated kingfishers, serpent eagles and many more. The sightings are always determined by the weather conditions. 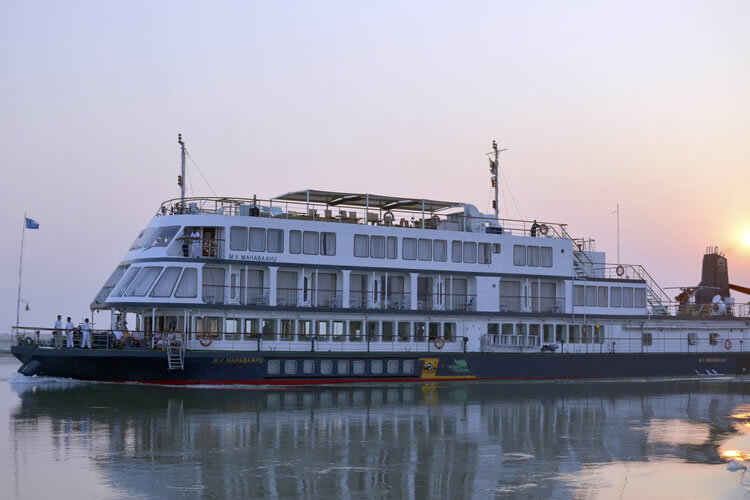 After breakfast on MV Mahabaahu, enjoy an interesting talk on ‘Kaziranga and the wild life in India’. Then step into your excursion boats to go to the shores of Bishwanath Ghat. As you walk through the village you are struck by the simplicity of life while the weaver women surround us with their silk and cotton weaves. Enjoy some happy interaction with them. Return to where the ship is anchored. Close by a co-operative Jute Mill is an interesting place to understand how the Jute fibre takes the form of very eco-friendly gunny bags. At sunset, we enjoy a cultural evening on the ship followed by an early dinner. Prized inhabitant of Kaziranga is the Greater One-Horned Indian Rhinoceros, but the Park is home to as many as 180 different mammals including wild elephants, tiger, deer, Asiatic wild buffalo and a rich variety of birds. We reach the Kohora Mihimukh range of the National Park and are ready to start our morning adventure; once-in-a-lifetime elephant-backed safari where we search for the elusive rhinoceros, tigers, swamp deer and hog deer and more and a large number of very interesting birds. The park never ceases to surprise. Catch up on Yoga on an island or on the deck for an hour and move on to breakfast while MV Mahabaahu lifts anchor and heads on towards an island that is occupied predominantly by a ‘bangla’ speaking Muslim community who are involved in the extensive farming. After lunch, enjoy a talk on ‘Kamakhya and the Occult and Peacock Island’. After a visit to this village, return to the ship for lunch and sail towards the Peacock Island---famous for the highly endangered Golden Langur. It would be a good idea to have one’s binoculars and cameras at hand. Later sail towards Pandu Port. Get ready for the Farewell Dinner ‘Alvida Bhoj’ and enjoy a relaxed evening. After a relaxed breakfast. Luggage down, as per the flight schedule. With packed lunch, drive to the Kamakhya Temple (flight time permitting). This Temple is devoted to the eternal feminine the Kama Khya, goddess of desire. Bid farewell to the land of Kamakhya and drive to the airport to board our onward flight. Terms and conditions apply. All offers are subject to availability and operators booking conditions. 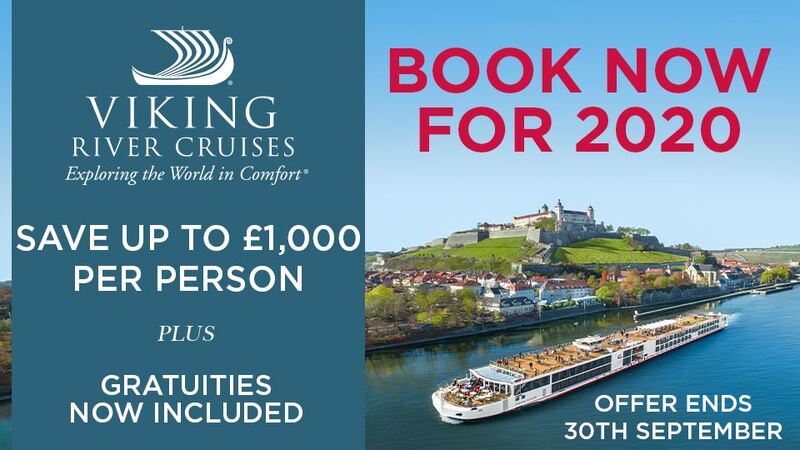 Prices are based on cruise only & two passengers sharing the lead in grade stateroom unless otherwise stated. All discounts have been applied to fares displayed. 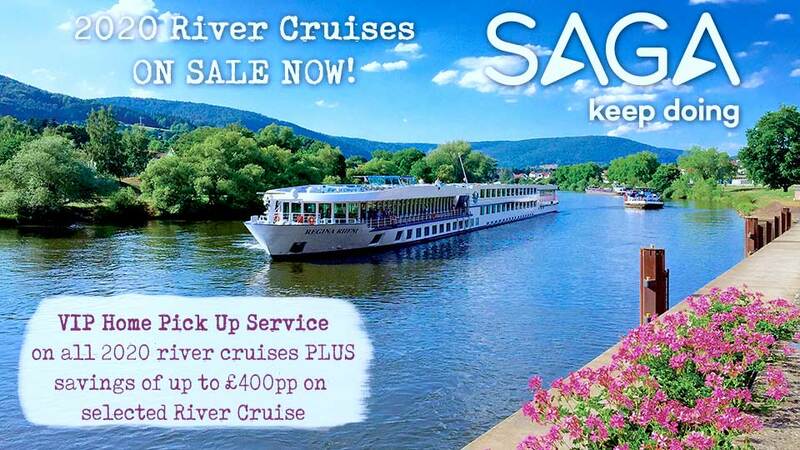 ^Itinerary operates in reverse, please call to confirm. *Savings of up to £680pp have been applied to fares displayed and are valid on selected departures booked by 31st May 2018. We charge a one-off small £20 booking fee. That’s it - nothing more and no add ons when you pay the balance. E&OE. ABTA P6710.